Its new year for all of us and now that the holidays are over, I am back to getting this post up for you guys weekly again. From the numbers, you guys seem to really love this series so I am happy to be back at it. This post takes me a loooong time but I try to have it up before Sunday for you all. Its not always up on Saturday nights but I try!! I will keep reminding you to buy the Sunday paper. 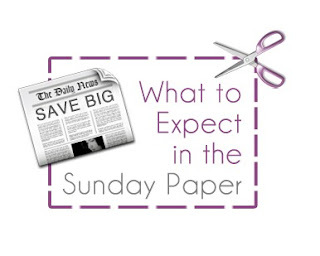 If you are new to couponing, THE SUNDAY PAPER IS A MUST!! More info below! So lets get on with it.. I KNOW THIS POST WILL LOOK THE VERY SAME AS OTHER WEEKS BUT ITS NOT. THERE IS LOTS OF NEW INFORMATION IN EACH WEEKEND NOTES POST. PLEASE READ THROUGH THIS FULLY BECAUSE I DON'T WANT YOU TO MISS OUT ON ANY NEW INFORMATION! SOME INFO MAY BE REPEATED BUT MOST IS NOT! ITS JUST THE LAYOUT THAT LOOKS THE SAME. AND IT WILL STAY THE SAME BUT THE INFORMATION IS NEW AND FRESH! *I have added a new element to the sales information. If you are like me, and still trying to figure this entire coupon thing out, you should check out COMMON SENSE WITH MONEY because she does a great job of telling us with coupons should go with the sale items.. Extremely helpful!! I put a link for each drugstore. This is not just beauty information. Its for all items in the store!!! So check it out! * Also I am loving THE KRAZY COUPON LADY too. Again.. I am new to couponing and pretty much learning with all of you so I have to have a little help too! This site has a wealth of information on it to help you learn out to use coupons and save money! Check it out when you have time! *You will see some repeats on here and it will stay that way. I know a lot of you read this blog daily but there are also a ton of new readers each day and I want them to have the same information as you! All the links are updated weekly so be sure to click on them to get the most out of this post!! * I got a few emails about other grocery store savings information besides Ingles. I am sorry but at this time, I am going doing grocery store sale information for the store I use. Yes, I know there are many other grocery stores, but I just don't want to post everyone of them. You can check out Money Saving Mom for a complete list of all the stores across the US. * As you can see the blog design has changed! I hope you like it! I was having problems with the code and came back to this one because I like it so much. I won't be changing it up agian till maybe Febuary! I save each of the templates and can always just switch back anytime I want! * Also if you are interested in the first blog I started you can click HERE to check it out. I think I am going to start bringing some of those post over here! * I have also been working really hard to update TWITTER. So if you'd like, follow and we can talk. 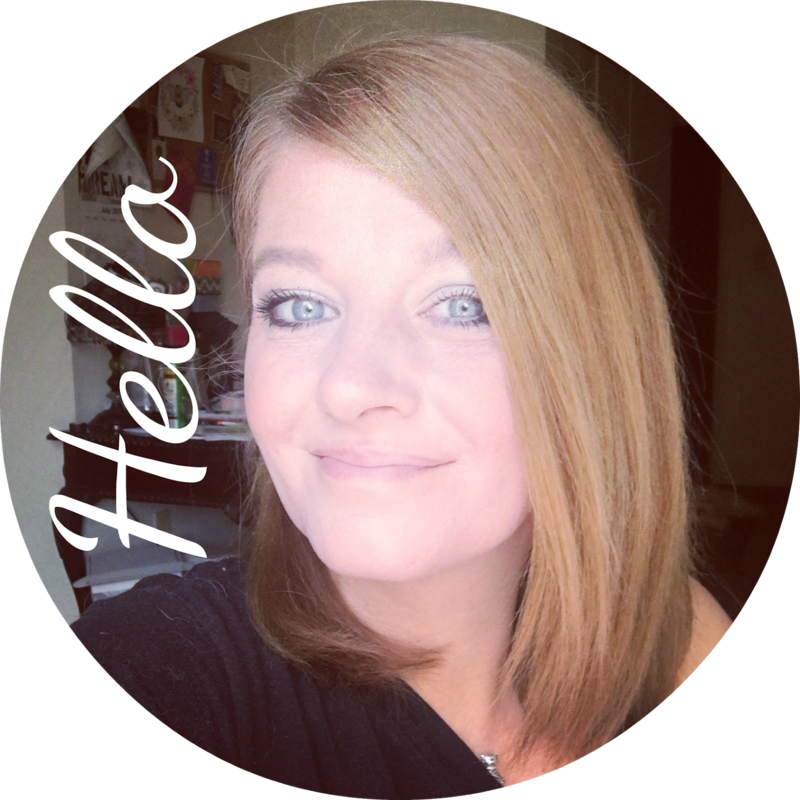 Also I am always updating FACEBOOK so if you would like be friends, just send me a request and let me know you are a blogging friend and I will accept! So you don't ever miss anything. However YOU HAVE to verify the email so be sure to do that or you won't get the daily updates! And don't forget you can always click the FOLLOW button at the top left side of the blog above the header! BOGO1/2OFF select Secret deodorant and antiperspirant. This week at CVS you can get a really good deal on Almay. ( which includes the new new shadow sticks that I showed you in THIS post..They are $ 5.99 with 3 dollars in extra bucks.. So you would be paying a total of $ 2.99 per shadow stick! Also this week, L'Oreal is having the same sale where if you spend $ 15.00 you get $ 5.00 in extra bucks! SEE THE FULL LIST OF WALGREEN'S DEALS WITH COUPONS CLICK HERE. This month there are some great coupons with the Video Value Program. If you check you will find a $2.00 Coupon for Revlons Lip Butters and also till January 28 they are running a promotion called Resolution Rewards. If you spend $100 on certain products you will receive $ 20.00 in up rewards. Plus they have a $ 10.00 rebate for Neutrogena items when you spend $30. Click HERE for details. Now if you live in my area here is what is on sale at INGLES.. Click HERE TO SEE WHAT YOU WILL FIND THIS WEEK ON SALE. *They will not double Internet printable coupons. * They will double 3 coupons for every $10.00 spent. * They only double 1 like coupons per transaction. There are three main coupon inserts that come in the Sunday paper. The Smart source (SS), the Red Plum (RP) and the Proctor and Gamble (P&G). Now one important thing to note it that not all papers get all the inserts. Or you may get the insert but it may not have all the coupon in it. Larger city’s tend to get more coupon, or higher value coupons. So just because I have it listed does not mean it is always in your Sunday paper. * Register your Ingles card with UPromise and SavingStar to get extra eCoupon savings. Since we live by Kmart I am going to start adding their sale items to this page. I also want to start adding Walmart but I still have to hunt down all their sales info, so just be patient! You can also check out their COUPON CENTER to print out and use at the store. They are also offering free samples now. Click HERE to see if there are any you might be interested in having mailed to you! I am going to be adding this Walmart Section to the blog from here out too.. It will take a little time to get it all together but for right now..
Walmart does not typically publish an extensive weekly sales circular, their everyday low prices can be very competitive with supermarket prices. Matching coupons with their regular prices can offer big savings. Walmart stores does not double up coupons, but do accept coupons at face value. There are a ton of online sites that offer you coupons that you can print out or codes that you can use. A few of my favorites are.. They all help in a lot of the information on these Weekend Notes Post! Also before you walk away with it.. check to see if the coupons are actually in the paper. I have bought a paper where the coupons were stolen. I went back.. made a fuss and got it replaced for free.. Another thing to consider.. you can buy more than one paper if you want more coupons! This week there will be only 1 coupon insert. I guess they have to make up for the all of the great ones from last week! :) There will be 1 SmartSource in the paper on Sunday. Get a sneak peek at what’s going to be in each of the inserts! And don’t forget about the hundreds of coupons on our Printable Coupon Database, including those from Coupons.com, RedPlum and SmartSource. Also, make sure to check your Parade Magazine or USA Today (depending on where you live) for coupons as well. So BE SURE to go out and get yoru paper tomorrow/today!! I might just by 10 of them. I am starting to figure this coupon thing out and I am loving saving money! Also All You has some great coupons in it this month of November.. I will get a full post up of all their coupons in the coming days but this magazine does offer some great advice to save money along with their coupons. So grab it when you are out and about! With All You, Most issues have $80 to $120 worth of coupons in them and often, the coupons are a much higher-value than what you’ll ever see in the newspaper. In addition, at least a few times per year, there will be a coupon for a completely free item. Love that! 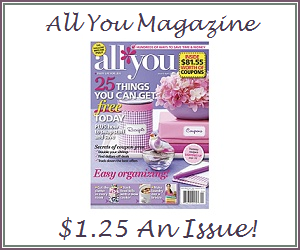 ALL YOU magazine retails for $2.49 per issue at Walmart. The best deal you’ll usually see online is around $1.50 per issue. If you’ve not seen ALL YOU magazine before, You should flip through an issue at your local Walmart before spending the money to pay for this subscription. It’s a great deal, but only if you’ll use the coupons and like the magazine. So check it out before you make the purchase. I am actually am almost caught up on emails.. wooooo-hoooo!! Well for the time being I am. I am sure they will pile up on me more but right now I am ahead of the game! I want you all to know, I love your emails. I really do, even the ones that are not so nice when done with respect. I might want to publish some of them, but I WILL NOT use your name or email. I don't do that. I have set up this system because I have found it works better to weed out the nutty people! Please don't hesitate to send those emails in and tell me what you think about any post! I will let you guys know if I update this post and remember you can get to it from the link at the very top of the blog!! And if you are out shopping and have a smart phone, you can pull this list up while you are in the store. It will help!